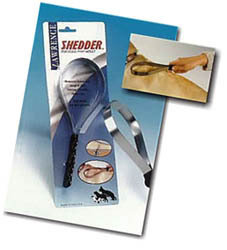 The shedder is the most effective way to pluck out dead and semi-dead hair from any breed of dog. 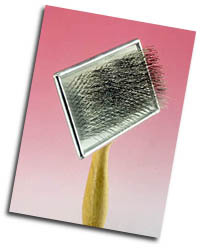 Regular use of the shedder also reduces hair on carpets or furniture. 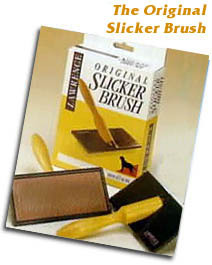 The “SHEDDER” is made of a serrated loop of 302 Grade stainless steel with a moulded comfort grip and is ideal for dogs whose moulting [shedding] causes a problem around the house. Technical note – Dogs have three hairs growing from each hair follicle. At any time there will be dead, semi-dead and growing hair in each follicle and moulting [shedding] takes place as the dead hairs are replaced. Note:- some breeds eg. Poodles and Schnauzers do not moult as, like ourselves only one hair grows out of each follicle and from time to time must be cut. When pulled lightly across the dogs coat (view Animation), the SHEDDER gathers the loose and fallen hair. Collect the hair at the base off the dogs back and dispose. 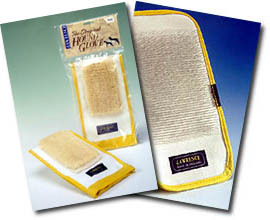 Regular use of the SHEDDER will prevent loose hair gathering in the dog's coat which then falls out as the animal rubs against furniture or on the carpet. Stroke gently down the dog’s back in the direction of hair growth. Gather up the fallen hair like garden leaves ! Use outdoors first time as the SHEDDER will lift off so much dead hair !